Nha Trang isn’t your typical seaside town. Combining high-rise resorts and a laid-back backpacker scene, this city caters to absolutely everyone. Nha Trang has a beautiful turquoise bay wrapped in a crescent shaped beach of white sand and palm trees, backed by a cosmopolitan city and a ring of mountains. 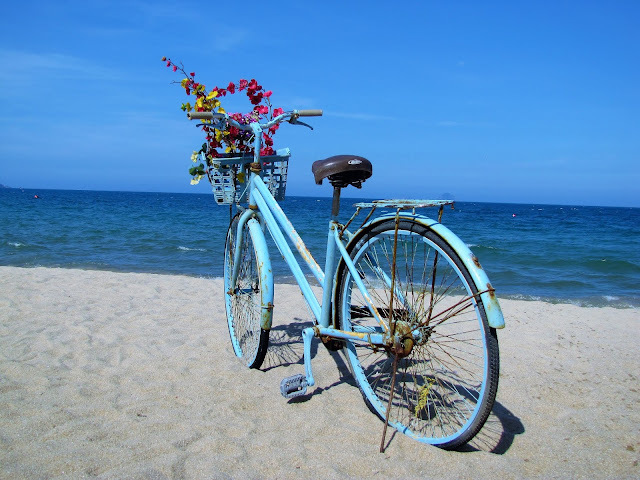 No matter where you stay you are never more than a 15-minute walk from the beach. Whether you are into visiting historic temples and learning about the local culture or having a relaxing day on the beach sipping cocktails, want to explore the local markets or looking for a relaxing wellness retreat to get away from noise and stress, Nha Trang has a bit of everything. The Po Nagar Cham is the hallmark site for understanding the cultural and religious heritage of Nha Trang. Built between the 7th and 12th centuries, the complex once consisted of 8 towers, but only 4 of them remain today. All the temples face east, as did the original entrance to the complex. In the past, worshippers passed through the pillared meditation hall, 10 pillars of which can still be seen, before proceeding up the steep staircase to the towers. The remaining towers are still being used today by Cham Buddhist, so it is important to remember to remove your shoes before entering the towers. The complex will provide robes to cover yourself up before entering the towers as well so there is no need to worry about your attire. Po Nagar Cham is located just 3 km north of the tourist center, just on the other side of the river, and costs 22,000 VNC/1 USD to enter. Mud baths have become a quintessential experience when visiting Nha Trang. I think it is safe to say that sitting in a tub of mud feels just as odd as it sounds, but it is well worth the experience. The mud is purported to have all sorts of healthy healing properties, as well as softening your skin. 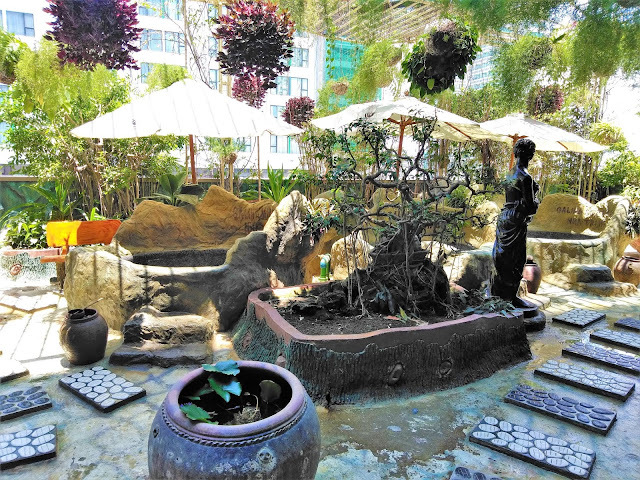 There are four places in Nha Trang to try out mud baths; all with slightly different experiences and quality. Thap Ba Hot Spring is the cheapest and most popular of the four, but that also means that it by far the most crowded. Located about 6 km northwest of the tourist center Thap Ba Hot Spring costs 150,000 VND/6.82 USD for a communal cold mud bath or 600,000 VND/27.27 USD for a private cold mud bath. This includes access to the pool, but you will need to rent a locker and towel. 100 Egg Mud Bath is another popular location for tourists. This location serves up warm mud to bath in, which is reportedly much silkier than that at Thap Ba Hot Spring, and has cleaner facilities overall. Located 6 km southwest of the tourist center 100 Egg Mud Bath costs 250,000 VND/11.63 USD for a communal mud bath or 300,000 VND/13.64 USD for a private bath in an egg-shaped pool. Paying for the mud bath gives you access to the pools, lockers, and showers, but you will have to rent a towel. 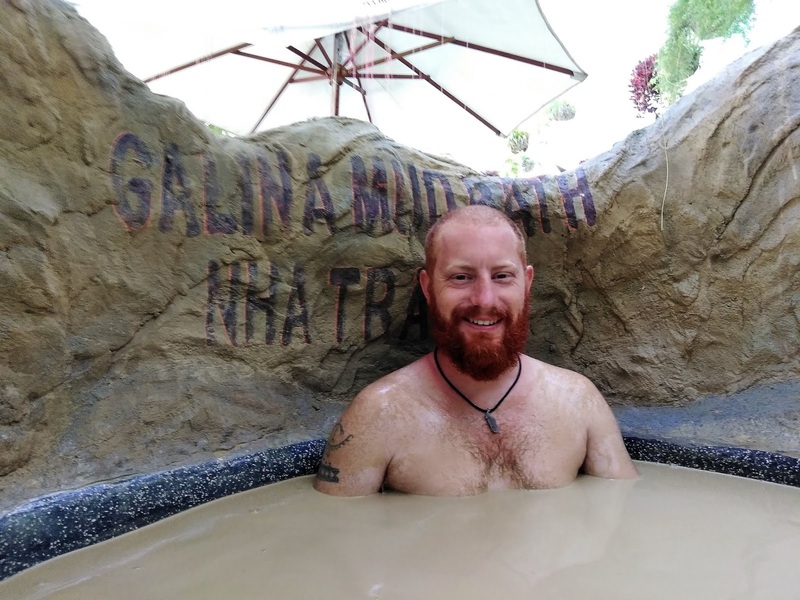 Some of the mud baths in Galina Hotel and Spa. I-resort (8 km northwest of town) and Galina Hotel and Spa are two higher end experiences available in Nha Trang. Galina Hotel and Spa is a four-star hotel located right in heart of the tourist center. I personally really like my experience there. The cost is slightly more than the others, depending on the package you get, but it comes with many more amenities. The package I bought was 350,000 VND/15.91 USD and came with a personal mud bath, steam room, sauna, hot tub, mineral rock bath for your feet, pool, pressure showers, locker, and towel. There is also a bar where you can order some drinks or a hooka to help you along on your day of relaxation. Nha Trang’s beaches far surpass their reputation and let’s be honest, you can’t go to a beach town and not go to the beach. Comprising of 6 km of pristine white sandy beach, bordered on one side by beautiful turquoise water and the other by a wonderful promenade of palm tree covered walkways and parks. The entire beach is free to enjoy, but most of the lounge chairs are either reserved for the hotels nearby or up for rent (usually costing 40,000 VND/1.82 USD for the day). If your looking for a place to sit back with a drink or food then Sailing Club Nha Trang, Louisiane Brewhouse, and Bốn Mùa Park (I’ll come back to these last two later on in the craft beer section) are the places to go. The drinks and food may be a little pricy but it’s a small price to pay for a good beer or cocktail in a lounge chair on the beach. Along the beach outside Bốn Mùa Park there are also an array of props in the sand for the perfect photo opportunities. One of the many picture props on the beach near Bốn Mùa Park. If snorkeling or diving is your thing then Nha Trang is the place for you as well. With its clear blue water and the chain of small islands, with their coral reefs, not far away, Nha Trang has been touted as the scuba diving center of Vietnam. There are a number of scuba shops that put together scuba/snorkeling tours to the different areas. You can get 2 dives for as low as $85 USD or get your PADI Scuba license for as low as $250 USD. View of Nha Trang from the mud baths in Galina Hotel and Spa. You can’t go to Vietnam without visiting a market or two while your there and Nha Trang has a few. The question is what kind of experience are you looking for. If you are wanting to see the real deal then Xom Moi Market is where you want to go. Xom Moi Market is where many of the local buy their fruits, veggies, and meat so you will get to see a real market in its raw form. If you want to see it at full swing then you will have to get there early. Located around markets you will also always find some great food stalls. On the other hand, if you are just looking to score some souvenirs then the market along the main street across from the beach or the night market it what you are looking for. Here you will be able to find anything from Vietnamese souvenirs to cheap clothes. Brewery at the Louisiane Brewhouse. Last but not least, Craft beer! You had to know this was going to make the list. 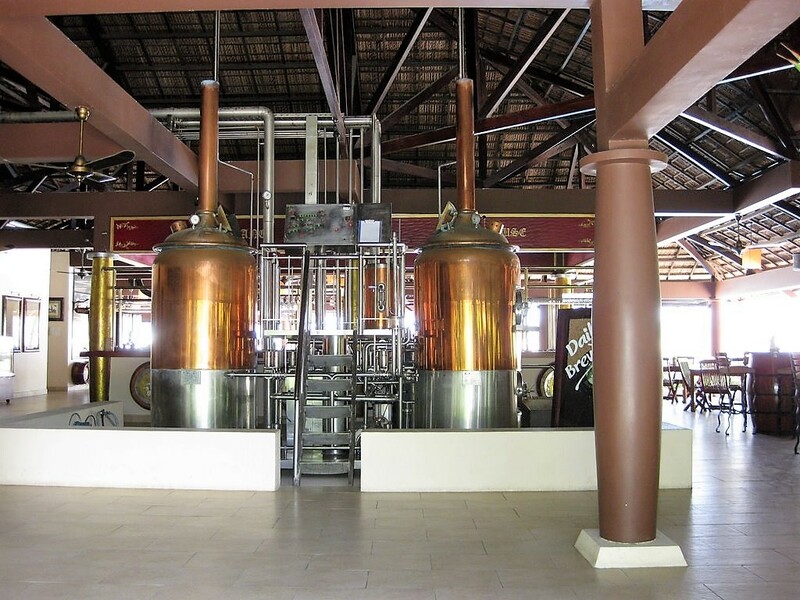 The craft beer scene has hit Vietnam and they have run with it and Nha Trang is no exception. There are two locations worth hitting up if you are looking to tick off another craft beer; Bốn Mùa Park and Louisiane Brewhouse. Bốn Mùa Park is an open-air restaurant on the beach and sales two craft beers actually brewed at the Galina Hotel and Spa, but why would you want to drink a beer in a hotel when you can do it on the beach. The real jewel of Nha Trang though is Louisiane Brewhouse located on the beach just south of the tourist center. At the time of writing this they had 7 different beers on tap; all worth trying. So order a tasting tray, a pint, or a 5L giraffe and grab a seat around the pool or in a lounge chair on the beach and enjoy a new craft brew. Taking a bus is by far the cheapest option available when traveling around Vietnam and there a quite a few options for you to choose from. Many tourists use the Open Bus Tour from TheSinhTourist, because it allows you to pre-purchase tickets to up to seven locations and works as a hop on/off bus. Many of its offices are also near the tourist centers, making for easier access, but you will pay a bit more for this option. This option also only leaves once in the morning and evening. 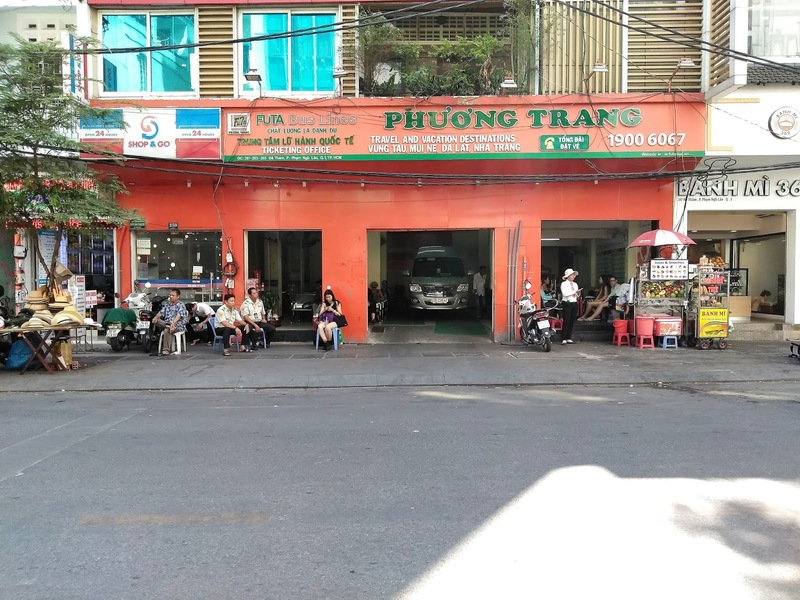 The Futa Bus office in the backpackers district in Saigon. My personal favorite is the FUTA Bus (Phuong Trang). Their offices are also conveniently located in tourist centers and they will transport you to the bus for no extra charge. This option has many different travel times so you will be able to pick the one that fits better for you. The train is another great option for traveling to Nha Trang. Trains usually travel cross country, so give you the opportunity for some great views of the countryside. The trains are pretty comfortable and have vendors that come up the aisles with snacks and drinks for you to buy. The trains leave multiple times a day and from most of the major town in Vietnam, so you have many options for when you want to travel. The train is quite a bit more expensive than a bus though; ranging from 16 USD – 55 USD from Ho Chi Minh City, depending on your seating option. To buy your tickets you will need to visit the train station beforehand or if you would like to buy them online I suggest using 12Go. You can also fly directly into Nha Trang with both international and domestic flights. 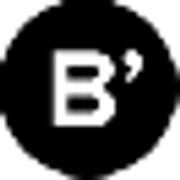 This option is understandably the most expensive option available. There are a number of domestic airlines that make thins flight from Ho Chi Minh City ($46 USD) and Hanoi ($61 USD). The Nha Trang Airport (CXR) is 30 km south of the city and takes 50 minutes to reach the city. You can get a fixed rate taxi from the airport to Nha Trang for 350,000 VND/15.91 USD. There are also taxis that is not part of the stand that can be negotiated down to 300,000 VND/13.64 USD. The airport also has a minibus that will transfer you from the airport to the old airport (no longer in use) just south of the tourist center for 65,000 VND/2.95 USD and then you will need to get a taxi from there to your hotel. 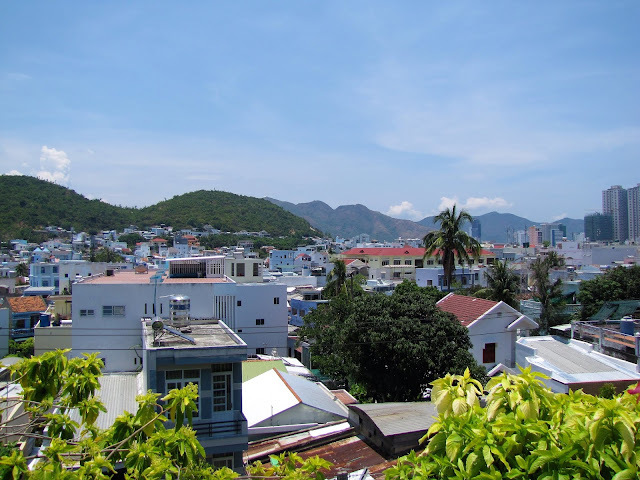 A view of Nha Trang from the Po Nagar Cham Towers. 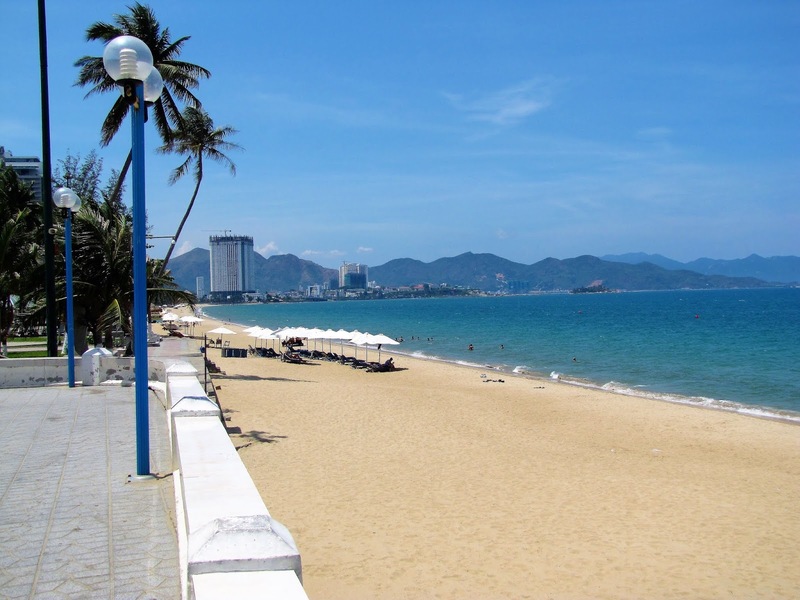 Nha Trang is a very popular tourist destination in Vietnam so there is no shortage of hotels. No matter what your budget you will be able to find accommodations for you. Due to the beautiful palm tree lined promenade that stretches the length of the beach, there are no hotel directly on the beach itself. There are plenty of hotels just across the road from the promenade though. 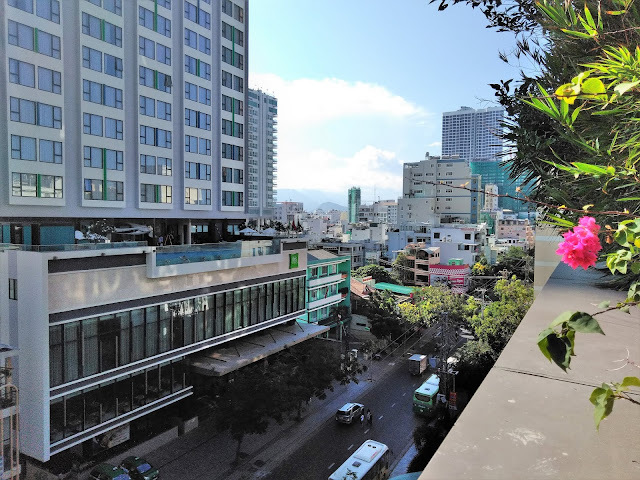 If you are looking for budget hotels you will have to go into town a few blocks but in Nha Trang the beach is never that far away. When reserving your hotel stay I recommend using Agoda to find the cheapest deals on the best locations. Grilled clams from a street vendor. Nha Trang has no lack of restaurants and street food. 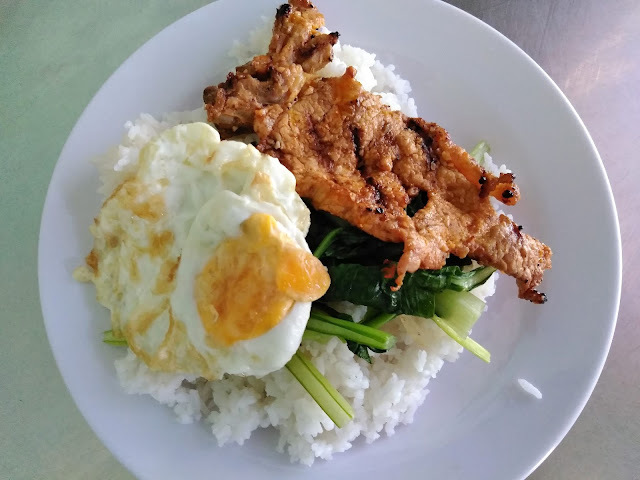 Being such a popular tourist location, you can easily find western style food within the tourist center, but I highly recommend getting out and trying some of the local food. 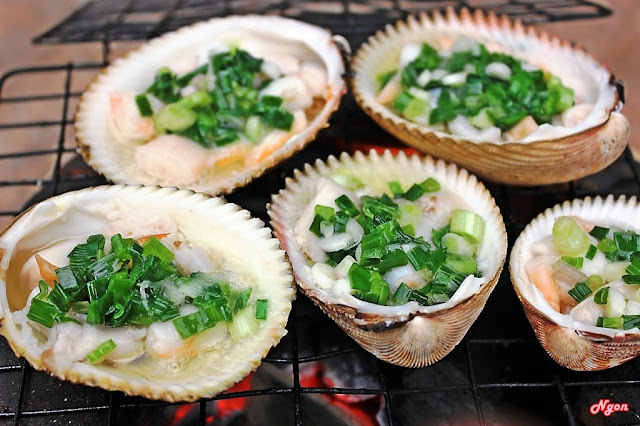 If seafood is your thing then the Xương Huân (south of the northern bridge) and Vĩnh Thọ (north of the bridge) districts are the place to visit. Here you will find terrace lined streets showcasing the fresh seafood in tubs outside the restaurant. The seafood here is slightly more expensive than you will find in other parts of Vietnam, but it is still worth it. You can also find cheap seafood at stalls in the backstreets of the tourist area for pretty cheap as well. The clams are delicious! At night you will also find numerous vendors popping up along the main road and promenade along the beach selling all sorts of different types of food. Most of these food options could be described as just a snack, but my personal favorites were the hotdogs and grilled chicken. What was your favorite part of Nha Trang?